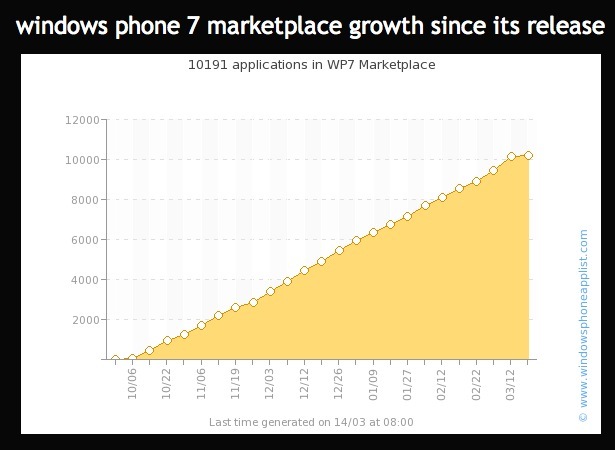 Windows Phone 7 has just passed a major milestone, clocking in at an astonishing 10,000 apps since launching in October of last year. This makes it the fastest growing app store of any smartphone platform, currently clocking in at some 600 apps per week. Let me say that again, 600 apps per week! By comparison, it took Android 11 months and Apple 142 days to reach these same benchmarks. What I find particularly interesting is the breakdown of free/paid apps, which is remarkably uniform. 32% of all apps are free, 38% are paid, and 30% are trial-based, which is a decidedly even split. A breakdown of app category shows that the lion’s share of the marketplace is owned by just three app types: games, tools, and entertainment, together racking up 49% of the available apps — and everything else trailing significantly behind.